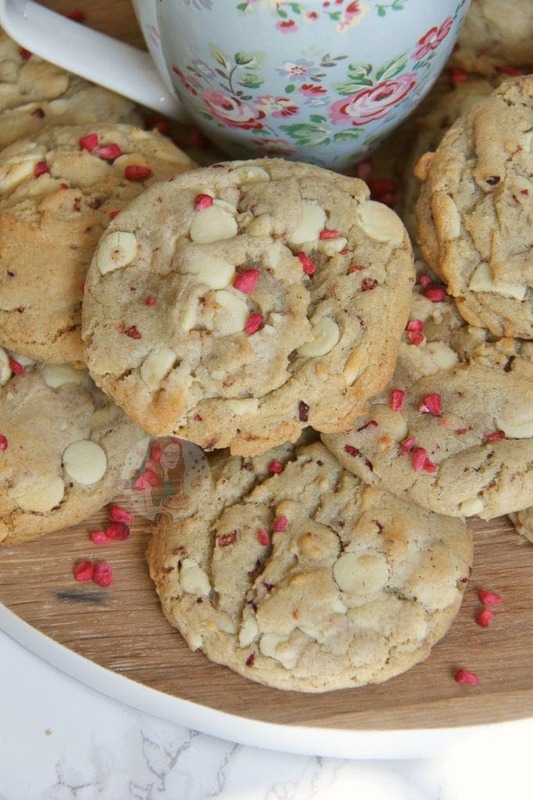 White Chocolate Chunks, Freeze Dried Raspberries, Gooey, Chewy, and Delicious Cookies that I never want to Share. 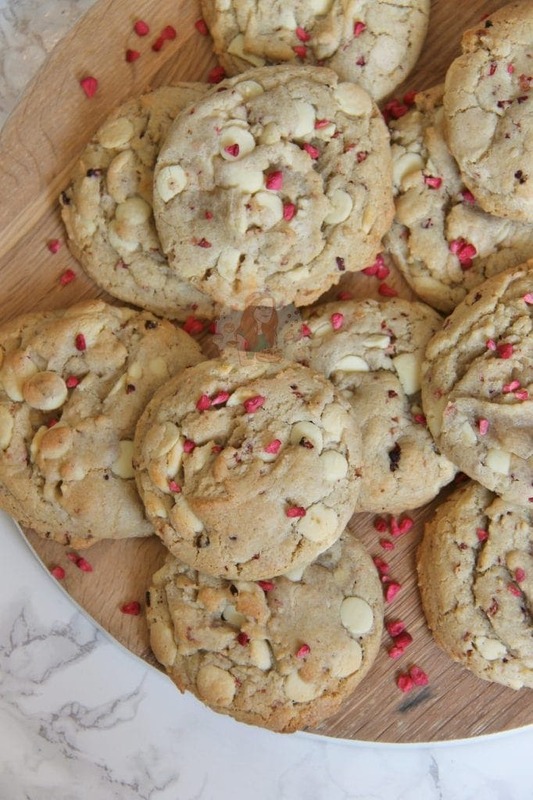 White Chocolate Raspberry Cookies are my new Favourite! So, I realise that I am slightly Cookie Bar obsessed, and it kinda made me realise that I hadn’t baked actual cookies in a while. I made my Rolo Cookie Bars again recently for a youtube video, and I ADORE THEM SO MUCH, but I felt like I wanted an actual cookie and not the traybake version. Luckily, I was in the mood for some baking and these were created and ohmydays they were dreamy. I used a very similar idea for the recipe as my Rolo Cookie Bars and Mini Egg Cookie Bars because I just adore how they work. I changed the recipes up slightly however, and wanted to make the cookie slightly thicker so that they didn’t spread. I often find with cookie recipes that don’t have cocoa powder in, the actual cookies can spread into thin awkward pancakes and its not pleasant. Using the same cookie recipe was alright, but adding in a little more plain flour, and swapping the sugars up slightly made them perfect. 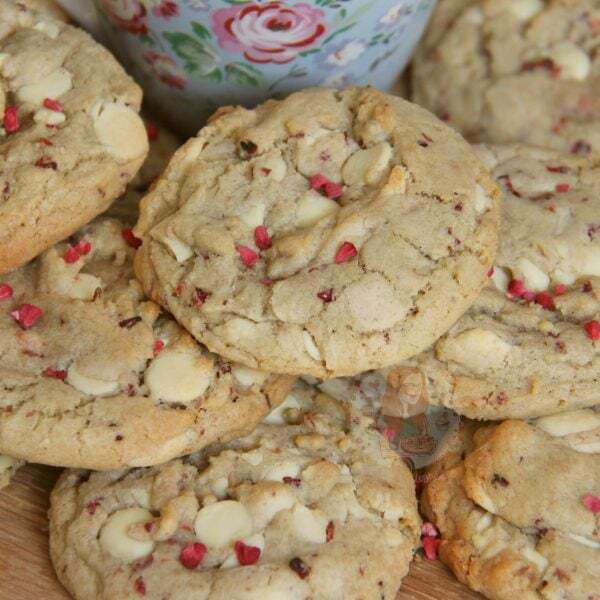 I used Freeze Dried Raspberries in these, are I just find it so incredibly easy. As soon as you add in fresh or frozen raspberries, you have to deal with a whole load of moisture. You can use fresh raspberries, you just have to chop them up quite small, dry them with some kitchen towel, and expect your cookies to spread a little more. I find with the Freeze Dried Raspberries you get a bit more flavour after baking, but thats my personal thoughts and taste of course! 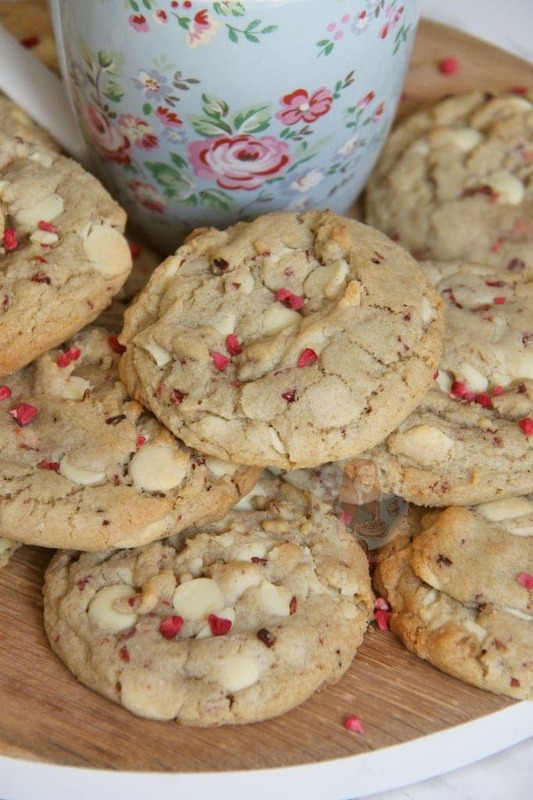 White Chocolate & Raspberry Cookies! Preheat the oven to 180C/160C Fan and line two/three large baking trays with parchment paper, leave to the side. Whisk the Plain Flour, Bicarbonate of Soda, Salt, and Cornflour together in a bowl and leave to the side. Add in the Vanilla and Egg and whisk again till combined. Add in the flour mixture, freeze dried raspberries, and Chocolate Chips and beat till everything is evenly distributed and a cookie dough is formed. Scoop the cookie dough using a cookie scoop for even portions, then roll into balls. Bake in the oven for 10-13 minutes. Leave the cookies to cool on the trays for 5 minutes, then transfer to a rack to cool completely! Enjoy! You can find Freeze Dried Raspberries in Waitrose, and often in other stores like Lakeland/Sainsburys. Freeze Dried Strawberries work in the same way, just have a strawberry flavour! Or, you can buy a large bag of them on Amazon, here! 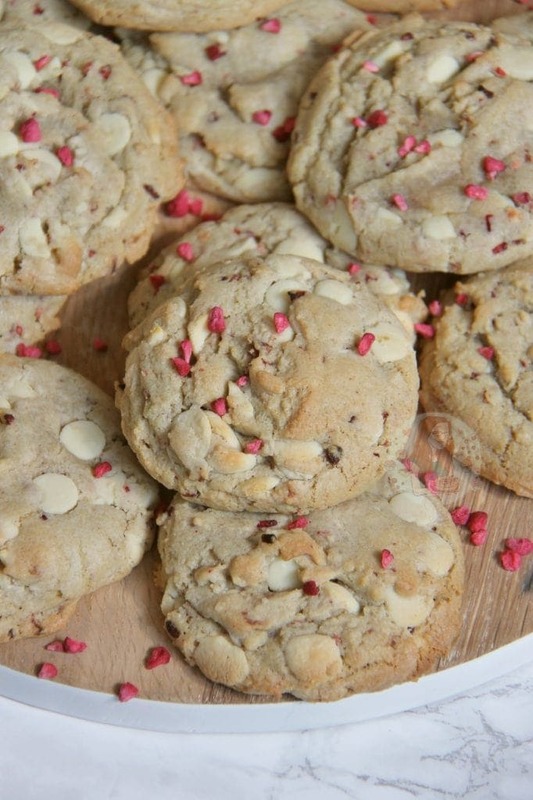 These cookies can last for three days easily, but they rarely do in my house! You can easily bake these into cookie bars by following the same method, but baking into a 9″ square tin, and baking for 20-25 minutes at the same temperature! 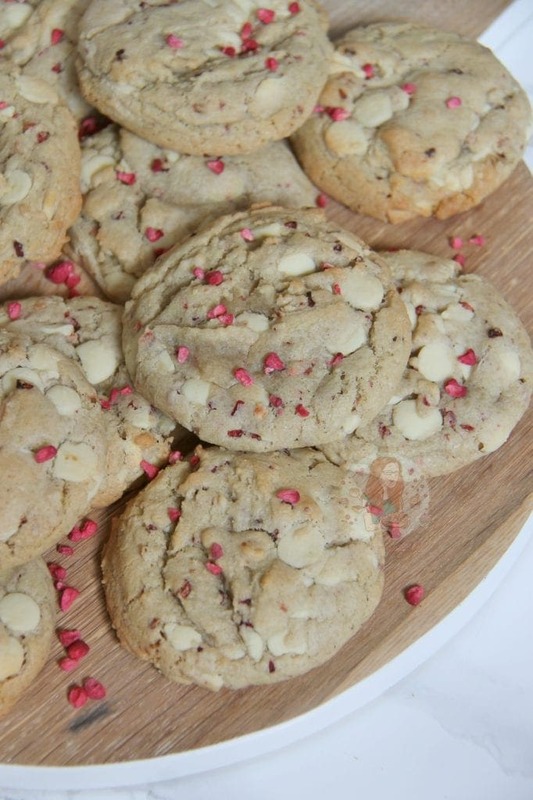 Find my other Cookie Recipes on my Recipes Page! Older Next post: S’mores Cookie Bars! Newer Previous post: Apple Crumble Cheesecake! Lovely cookies, but there don’t bake well from frozen. They don’t naturally spread like the others do and you have to give them a helping hand with a fork halfway through. Hi Jane! Looks delicious! I just wanted to ask , when you say melt the butter do you mean completely melt into liquid form? This sounds yummy! I never knew there was such a thing as a cookie scoop but now I see there are different sizes. 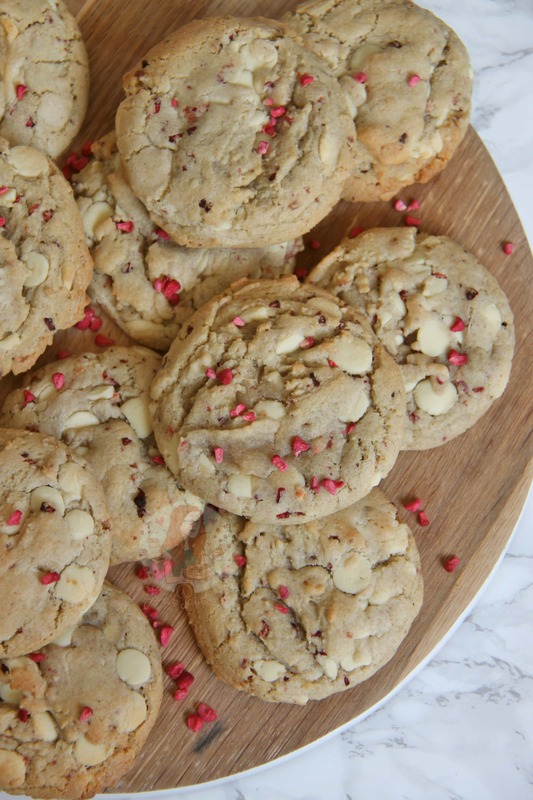 What size would you recommend for cookies? I use 5 or 6cm width ones usually! Can you substitute the raspberries with glacé cherries? I wouldn’t know as I haven’t tried. Glace cherries are quite sugary, and I’ve never baked them before.